Taxpayers overpay the IRS nearly $1 billion each year.¹ In fact, the average tax refund check last year was $3,026.² Hello instant raise! While a big, fat check from the IRS can feel amazing, the truth is much less thrilling. That’s because you’re not actually getting a pay bump. You’re getting a pay cut for 11 months out of the year. And the IRS is getting a very generous interest-free loan from you in the meantime. You and your budget deserve better. We justify overpaying the IRS with the idea that “it forces us to save.” But what are we saving for anyway? According to an online survey, 38% of those surveyed said they planned to use their refund check to pay down debt.³ As great as that sounds, getting a huge amount of money is pretty tempting. You may decide to spend a little here on a nice dinner or a bit there toward that new iPhone you’ve been wanting. Before you know it, your windfall might feel more like a dinky breeze. A better plan is to go ahead and adjust your W-4 withholdings. Then apply that extra monthly income toward your debts (or your current money goal). When you make it a habit, it’s more likely to happen. Here’s an example: Let’s say you owe $5,000 on your credit card with 18% interest. If you pay the minimum payment until it’s gone, you’ll end up wasting close to $7,000 on interest! That’s more than the original balance. Now, let’s adjust your W-4 to the proper withholding amount, which funnels an extra $225 back into your budget each month. Apply that extra cash toward your credit card balance and your total interest shrinks to a little over $1,000! Cue the hallelujah chorus. With your debts gone, you can get on with what’s important to you, like saving for emergencies and investing in your retirement. You can also get on with that trip to New York City—complete with fine dining and a luxury hotel! Just a thought . 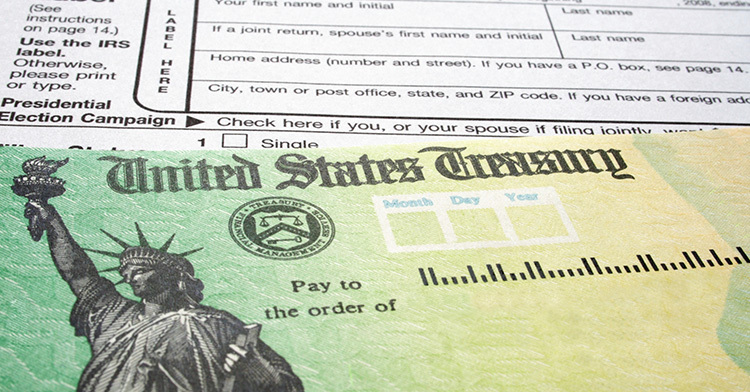 . .
Stop waiting on the IRS to refund your money. Give yourself a year-round raise instead. You literally earned it. Confused about how much to withhold from your salary? Talk with a local tax advisor in your community for tax advice you can count on.